Today, I going to introduce to you Marketing In Your Car Podcasts by Russell Brunson – CEO of Clickfunnels, author of 2 best selling book that calls “Dotcom Secrets” and “Expert Secrets book”. So this podcasts created for you. Before we dive into Marketing in Your Car mp3 podcast, you can watch the video introduce and unbox below. Any upsell in this product? #1: If you’ve ever been in marketing or sales or if you’re an entrepreneur or want to do a startup of your own, I’d love for you to subscribe to the podcast of Russell Brunson. He helps startups and businesses to grow. Every day he does a podcast for about 6 minutes during his commute to his office, talking about what they’re doing in their company (which BTW went from startup to over 29,000 ACTIVE paying members in about 2 1/2 years – crazy…). BUT… #2 The other cool thing is that he actually pre-loaded the first 257 episodes of his podcast on an mp3 player that you can get for free. The podcast talks about the big ups, the big success they had as well as the big huge crashes and not many people talked about that side of it. But Russell does it to help inspire entrepreneurs and show the struggles. He started his podcast about 5 years ago when he was right through his company to kind of collapsed and crashed when they’re starting to build from scratch. What they did, what worked, what didn’t work. He talks about family life, stress as an entrepreneur. This is some benefit I discovered after listening Marketing In Your Car Podcast. Each podcast normally 3 – 5 mins. Increase your traffic to the website, conversion rate. 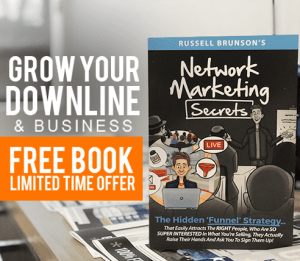 If you follow Russell Brunson, everyone knows he is a sales funnel expert. So he always uses the sales funnel in all of their products and services. He always gives his knowledge, strategy, experience for FREE. Then drive them to the next funnel (it’s fair). Step two of the order form gives people the option to buy the transcripts of all the podcasts for $17 as well. There is the transcript of 257 episodes (pdf and kindle version). So you can print out or put on your kindle and reading. In the next page, they offer Funnel University monthly to you. But you no need to pay any money right now. Because we have 14-day for trial and understand how it works. Behind the scenes of the successful funnel. Now the Funnel University has been closed. So you can not buy it. If you interesting with Funnel University and love what they do, What you can do right now is visit Funnelu.com and sign-up to join their waiting list. Funnel Immersion is the training course with over 80 hours designed for Russell Top client who “love” Funnel, deep into the funnel and immerse themselves with the experience. After bought the course, you will join the membership site that covers all those topic. The funnel immersion has $2,997 value. But if you buy it on OTO page, it’s only $297. Updated: Now, I’m not sure it available when you get Marketing In Your Car mp3 player. So if you are interesting with it. You can Checkout funnel hacker cookbook first, fill the information and they will drive you to funnel immersion offer page. Read the review and get your Free copy of Funnel Hacker Cookbook Here. The podcast actually FREE. You just pay $9,95 for shipping cost. The question is where they should ship it for you? Marketing in your car podcast is useful for me. I can learn, listening everywhere, anytime I want. If you want to increase your conversion rate, upgrade your business to the next level, Check it out through the link below. In my opinion, to help you get the best result, you need to read the “dotcom secrets book” and “expert secrets book” today! Of course, he gives away for FREE. You can read the dotcom secrets book review and expert secrets book review here before you get it. So, if you haven’t timed, hate reading, go travel, on the way to work,… no matter what is it. Remember, bring Marketing In Your Car mp3 Player podcast.